vehicle mishaps occur on and along the skyway corridor, 2016 on. 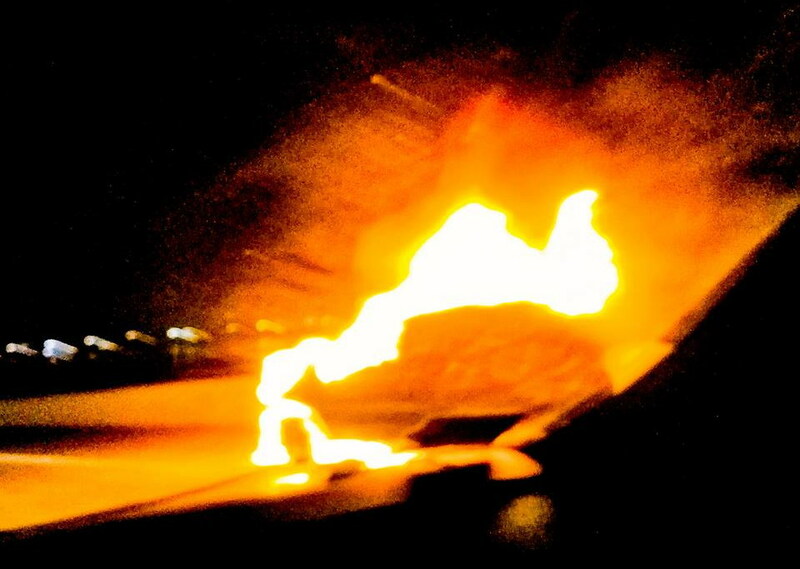 04.06.19, John V., facebook.com, A car was engulfed in flames last night! Looking like something tragic :/ This was around 12-1AM in the Southbound lane after the zenith. Just after it there was a cop with lights on and one seemingly random vehicle pulled over, I did not notice any damage. Anyone know what happened?! 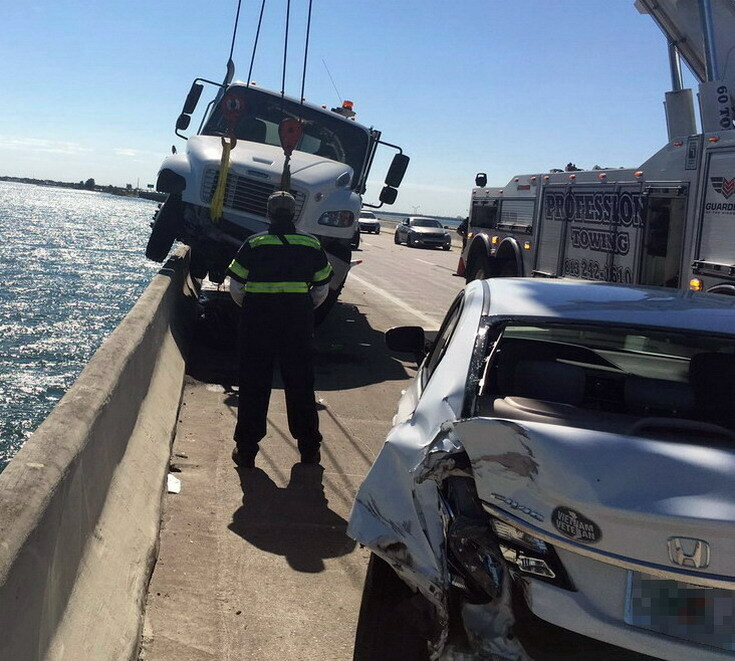 03.29.19, wtsp.com, Lanes reopened on Sunshine Skyway Bridge after crash on Pinellas County side. 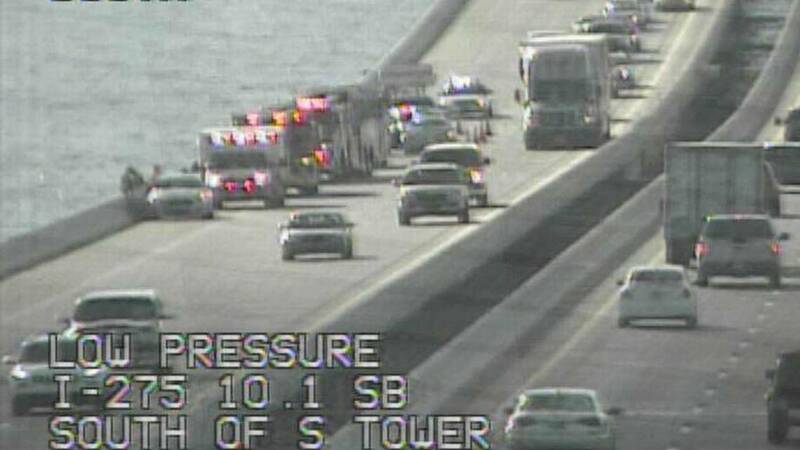 PINELLAS COUNTY, Fla. — Commuters dealt with traffic delays on the Pinellas County side of the Sunshine Skyway Bridge after a crash Friday afternoon. FHP says both southbound lanes were closed around 11:40 a.m. at MM9 for a crash involving roofing debris that caused nails, shingles, etc. to spill on the roadway. The trailer attached to the back of the truck started to jackknife while on the decline of the bridge, causing the crash to happen past the bridge. The momentum sent the truck crashing into the concrete wall on the inside lane. The shoulder of the road was opened around 12:57 p.m.to allow traffic to go by. 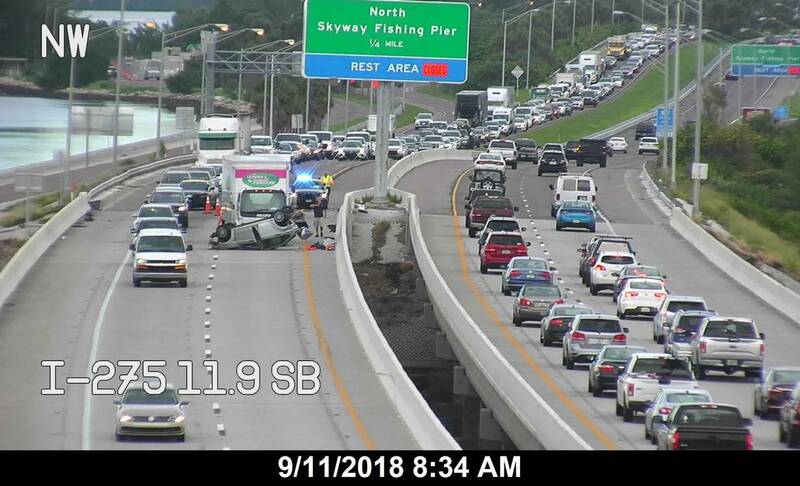 Both southbound lanes have been reopened as of 4 p.m.
03.08.19, IONTBfb, Skyway: Crash in Manatee on I-275 northbound at MM 9, right lane blocked. 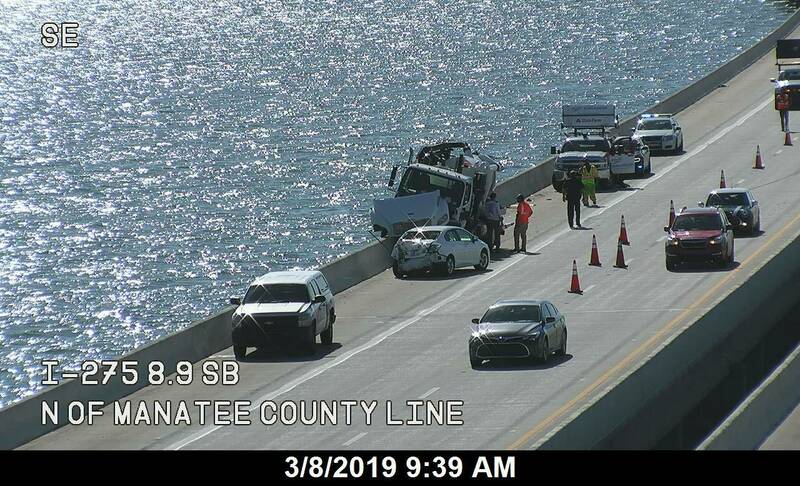 03.08.19, bradenton.com, Vehicle was stuck with wheel over Sunshine Skyway Bridge barrier wall. 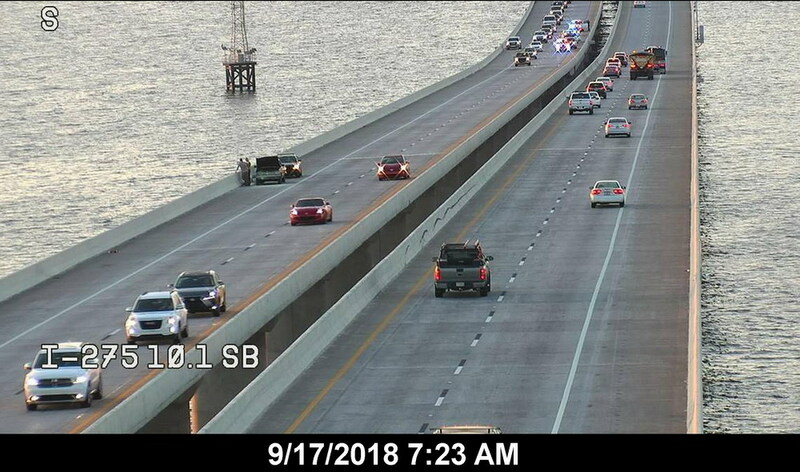 Crews blocked one lane of the Sunshine Skyway Bridge on Friday morning where a vehicle appeared to be stuck with one wheel over a barrier wall. 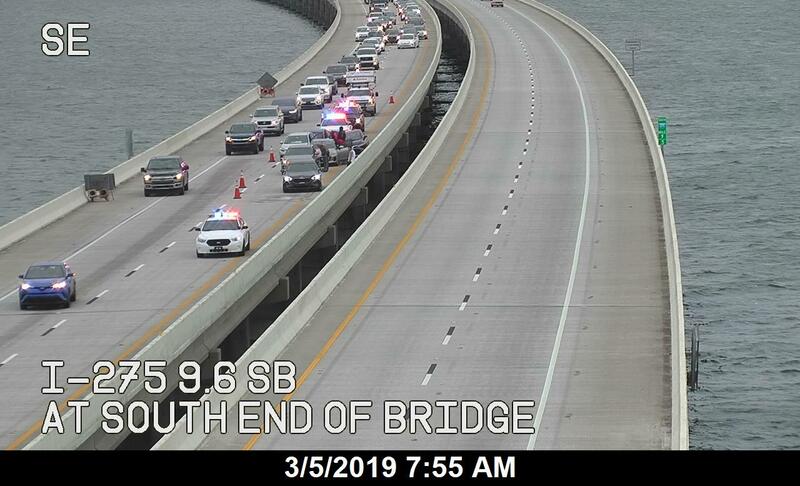 The outside northbound lane of the Sunshine Skyway Bridge was blocked for part of Friday morning while Florida Highway Patrol troopers investigated a crash. The crash occurred around 9:17 a.m., according to FHP. Troopers said a truck collided with a sedan before hitting the barrier wall. Minor injuries were reported. Traffic cameras in the area showed the truck with one wheel stuck over the barrier wall of the bridge. The lane has since reopened. 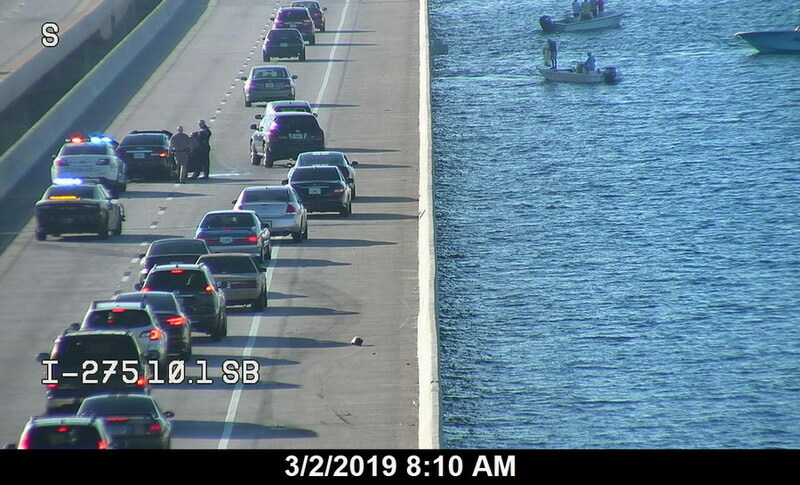 03.05.19, IONTBfb, Skyway: Large delays reported due to a crash in Manatee on I-275 northbound at MM 9, left lane blocked. 03.02.19, IONTBfb, Skyway: Multiple vehicle crash on I-275 northbound. Lane blockage reported. Expect delays. 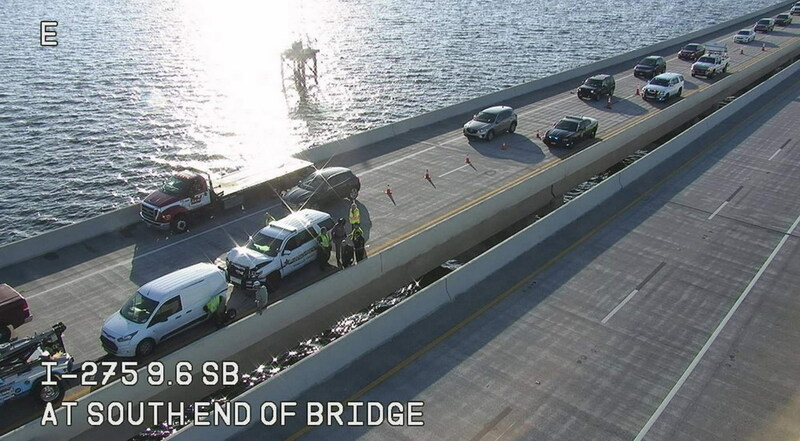 12.14.18, IONTBfb, Skyway Bridge: Crash blocking two northbound lanes of the Skyway Bridge. Expect delays. 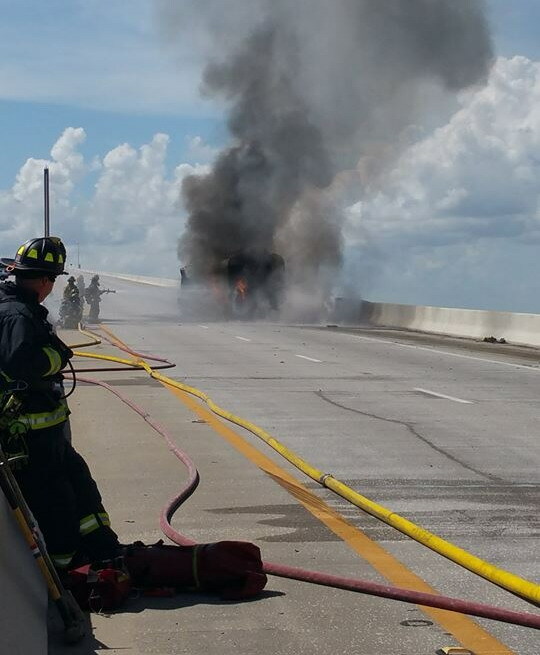 10.28.18, IONTBfb, Skyway Bridge: All northbound lanes on bridge closed due to vehicle fire following vehicle crash. No reported injuries. 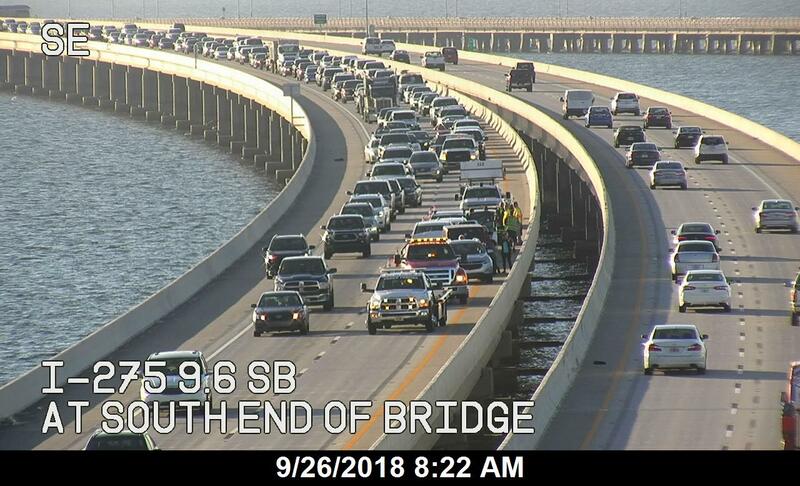 A seven-car crash is causing a major delay on the northbound side of the Sunshine Skyway Bridge from Manatee into Pinellas counties. The pileup is blocking the left-hand lane near the tower. Commuters are being slowed down by more than an hour as emergency crews figure out how to get enough tow trucks to the scene, according to 10Traffic. 10Traffic Anchor Hilary Zalla is urging drivers to take I-75 through Tampa to get around this delay. It was not immediately clear if anyone was hurt. 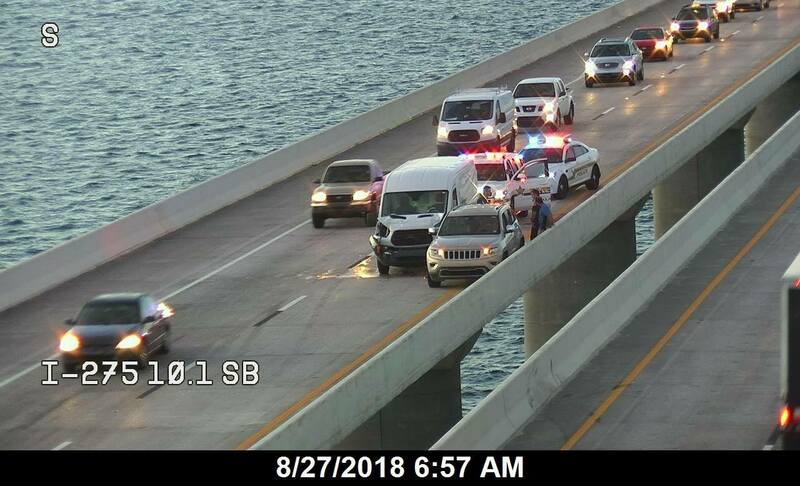 A crash involving a patrol car and a vehicle fire caused traffic to move slowly across the Sunshine Skyway Bridge early Monday morning. 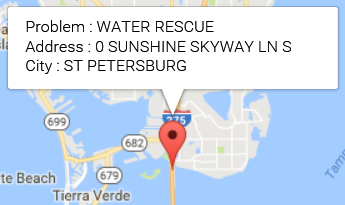 According to the Florida Highway Patrol’s live traffic map, the crash involving a patrol car was blocking the inside northbound lane on the Sunshine Skyway shortly after 6:30 a.m. The driver of the patrol car was hospitalized with injuries, according to broadcast reports. As of 8:30 a.m., it was taking more than an hour to cross the northern span of the bridge, according to broadcast reports. The live traffic map indicated that a vehicle fire also occurred on the bridge in the northbound lanes at 6:25 a.m. 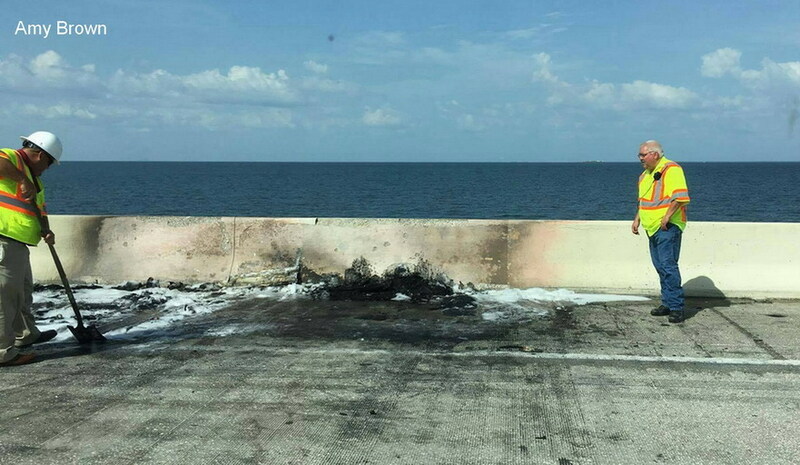 Troopers indicated smoke was still in the area around 7:30 a.m.
Manatee - All lanes of Interstate 275 were reopened after a crash and a vehicle fire had traffic moving slowly across the Sunshine Skyway Bridge on Monday morning. According to Florida Highway Patrol’s live traffic map, a crash involving a patrol car blocked the inside northbound lane of Interstate 275 on the Sunshine Skyway shortly after 6:30 a.m. Monday. 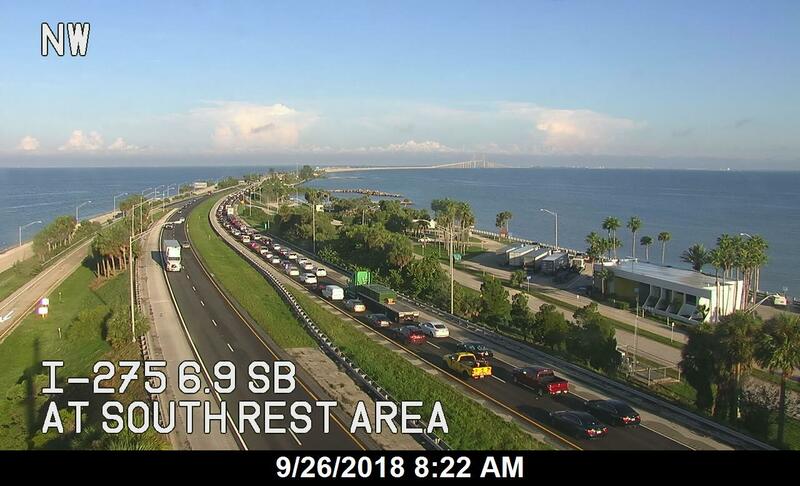 The lane was reopened by 10:20 a.m.
A vehicle fire also was reported on the bridge in the northbound lanes at 6:25 a.m. FHP noted on the live traffic map that smoke was in the area around 7:30 a.m.
A crash Tuesday morning has clogged southbound lanes on the Sunshine Skyway bridge. An inside lane is blocked following the crash, which occurred around 7:50 a.m., according to the Florida Highway Patrol. It is unclear if anyone was injured how many vehicles were involved. 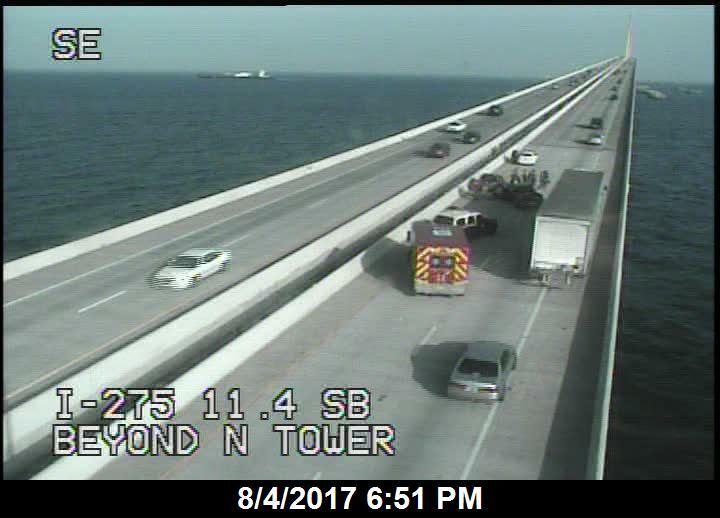 A crash on the Sunshine Skyway Bridge slowed traffic approaching Manatee County early Tuesday. 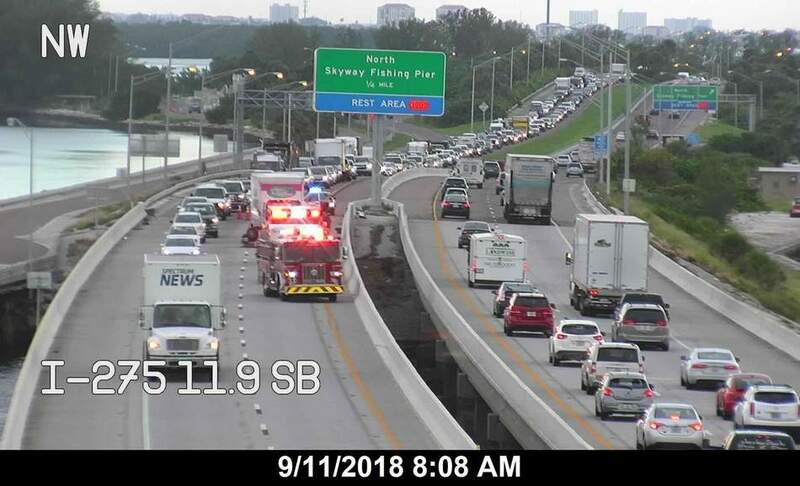 A crash with injuries was reported in the southbound lanes of Interstate 275 on the Sunshine Skyway around 7:49 a.m. Tuesday, according to the Florida Highway Patrol live traffic map. The Florida 511 traffic map shows an overturned vehicle in the inside southbound lane. 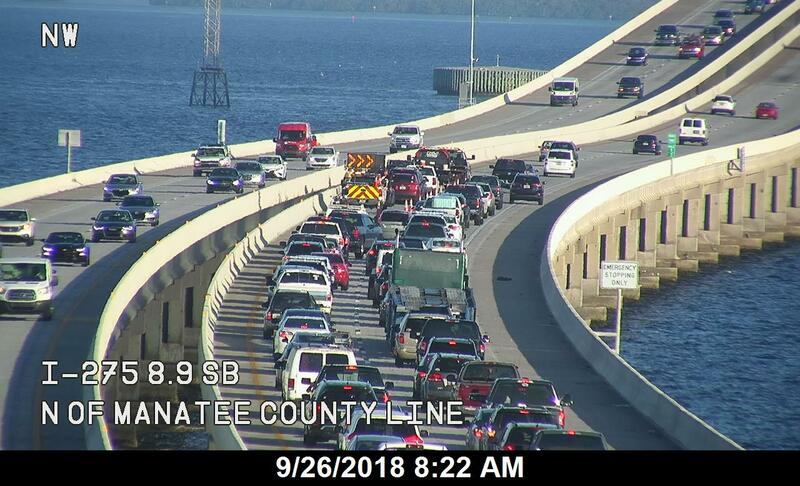 The lane of the bridge was reopened as of 9:45 a.m.
08.27.18, IONTBfb, Skyway Bridge: Expect delays due to crash in Pinellas on I-275 north before the hump heading to Manatee. Left lane blocked. ST. PETERSBURG (FOX 13) - The Florida Highway Patrol arrested a suspected drunk driver after he crashed his vehicle on the Skyway Bridge. The incident happened around 2:30 a.m. Saturday on the main span of the bridge in the northbound lanes. According to FHP, 26-year-old Benjamin Arntzen told troopers that another driver swerved into his lane and caused him to crash his Mazda. The vehicle had overturned after hitting a concrete pillar. FHP said troopers found open and unopened beer cans scattered on the roadway at the scene. Arntzen, who was not seriously injured in the crash, failed field sobriety tests, according to FHP. He was arrested and charged with DUI with property damage. 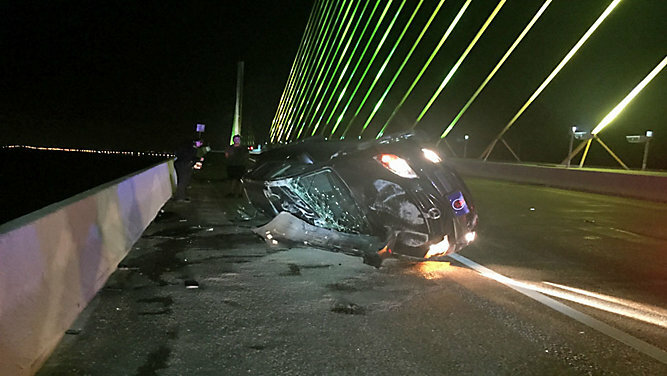 PINELLAS COUNTY, Fla.-- According to police, a St. Petersburg man was arrested and charged with DUI after crashing and flipping his car on the Skyway Bridge early Saturday. When officers arrived on the scene after the crash they saw several Coors Light beer cans both open and unopened around the overturned vehicle. One officer stated that he observed the driver exit the vehicle. The other officer identified the driver and owner of the Mazda as 26-year-old Benjamin Arntzen. The officer stated that he observed Arntzen swaying and smelled a strong odor of alcohol emitting from his breath. He said that when he spoke to Arntzen his speech was slurred. Arntzen told the officer that he had a cooler of beer in his car that was now on the roadway. He admitted to driving the vehicle at the time of the crash and said he was on his way home from work. The officer transported Arntzen to the nearest rest area so that he could conduct a DUI investigation in a safe location. According to the officer, Arntzen failed to keep his balance and performed poorly on the field sobriety exercises. Arntzen was placed under arrest for DUI at approximately 3:50 a.m. Arntzen was transported to the Pinellas County detention center at around 5:16 a.m. where he provided a breath sample of 0.136g. Arntzen was then transported to the Hillsborough County detention center where he was booked in without incident. 06.22.18, fox13news.com, Skyway Bridge traffic flowing after earlier crash, TIERRA VERDE (FOX 13) - A crash on the Sunshine Skyway Bridge closed some southbound lanes Friday afternoon. The scene of the accident is near the bottom of the incline before the north slope of the bridge. All southbound traffic was blocked earlier, though all lanes have reopened since the wreck. Traffic approaching the bridge remains slow. 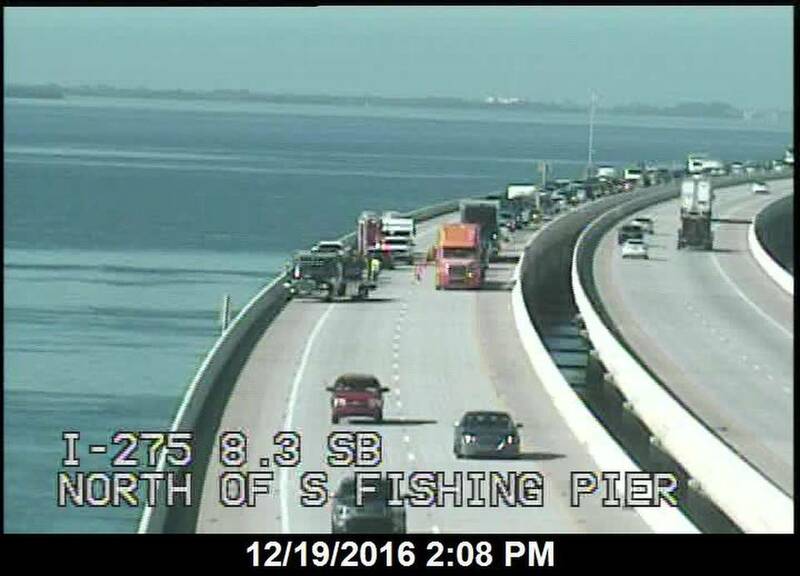 12.17.17, IONTBfb, Skyway Bridge: Rollover crash blocking southbound right lanes on I-275 on the Manatee side of the bridge. Use caution in the area. 12.12.17, bradenton.com, Crash on Skyway caused congestion during morning commute. Here’s what you might see on your Tuesday morning commute. 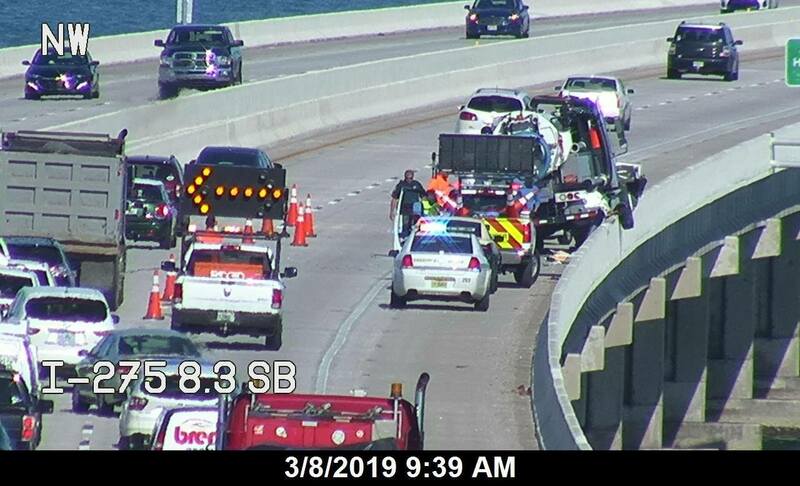 There were delays headed northbound on the Sunshine Skyway Bridge after a crash blocked the outside northbound lane Tuesday morning. According to Florida 511, the crash occurred around 8:30 a.m. The crash has since been cleared and traffic is flowing without delays again. No other information on the crash has been released. 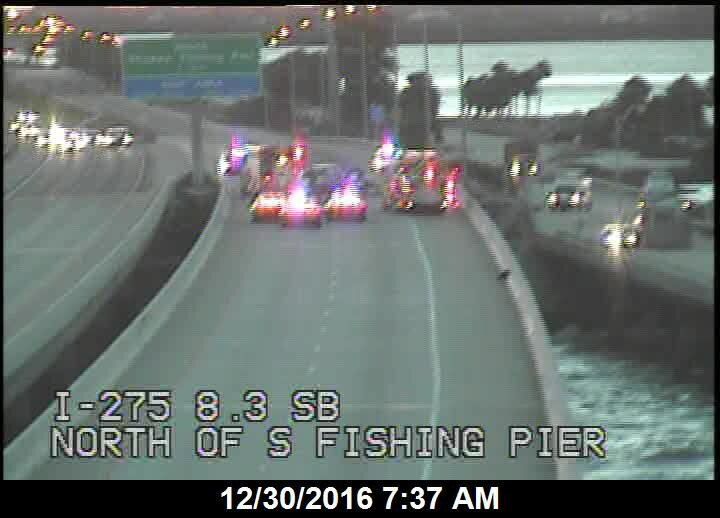 11.21.17, bradenton.com, A Tuesday morning crash that appears to involve a motorcycle caused southbound I-275 delays at the end of the Sunshine Skyway Bridge. The Florida Department of Transportation reported that the left lane was blocked near mile marker 9. According to Florida Highway Patrol, the crash occurred around 8 a.m. and there were injuries. By 8:51 a.m., the roadway had been cleared, FDOT said. 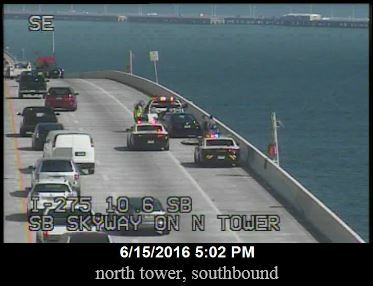 A crash involving an overturned vehicle has blocked the left northbound lane on the Sunshine Skyway Bridge Tuesday afternoon. Florida Highway Patrol responded to the scene around 4:05 p.m. Deputies say there are injuries. The Florida Department of Transportation reports that there is “major” backup. 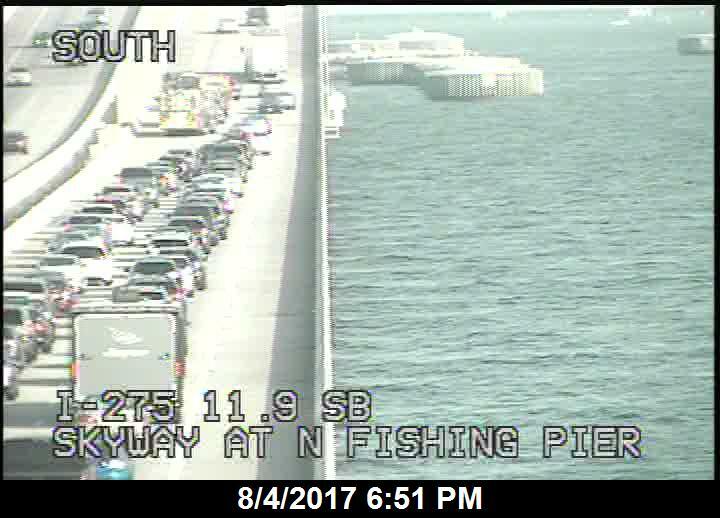 The crash is on the Pinellas side of the bridge, but FDOT reports that traffic on I-275 north is backed up to the Manatee County rest area. 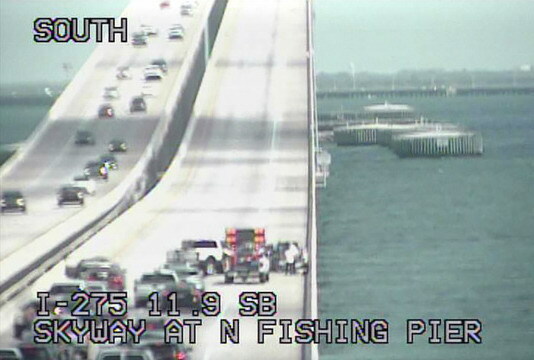 Pinellas - Crashes have shut down one northbound lane on the Sunshine Skyway Bridge, according to Florida Highway Patrol. The FHP website indicates two crashes happened on the northbound lanes of Interstate 275 north of the bridge. One crash was reported at 8:04 a.m. and the second at 8:27 a.m. There were no reports of injuries. Bay News 9 reported traffic delays could be up to an hour. (WFLA) – All lanes of the Sunshine Skyway Bridge have reopened after a crash on Monday afternoon. However, traffic is expected to move slowly on the bridge because of a large backup caused by the crash. The Florida Highway Patrol reported that the crash blocked the northbound lanes of the bridge near mile marker 8. The accident happened around 2:48 p.m. The crash closed all northbound lanes for 30 minutes before troopers were able to move the vehicles onto the shoulder of the road and open one lane. Several people suffered minor injuries, but no one was taken to a hospital. 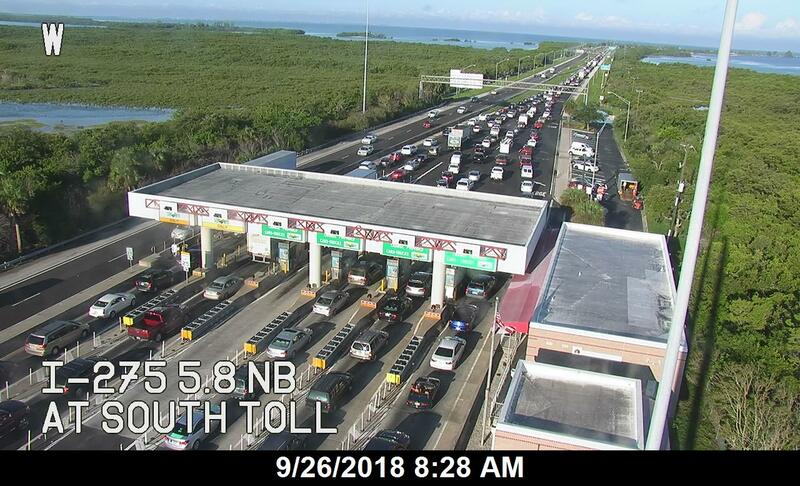 ST. PETERSBURG — The Florida Highway Patrol is reporting that an accident with injuries is slowing northbound traffic on the Sunshine Skyway Bridge this afternoon. Just before 3 p.m., troopers responded to a crash in the northbound lanes near the 8 mile marker. Troopers said a vehicle had collided with a sport utility vehicle and overturned. The SUV then collided with the inside barrier wall, then hit two other vehicles. The crash closed all northbound lanes for a half-hour and now one lane is open, troopers said. Troopers said several people have minor injuries but no one was taken to the hospital. 01.10.17, IONTBfb/iontb.com,	Skyway: Fire rescue responding to overturned tractor trailer in the northbound lanes. Extrication units responding. Expect delays. 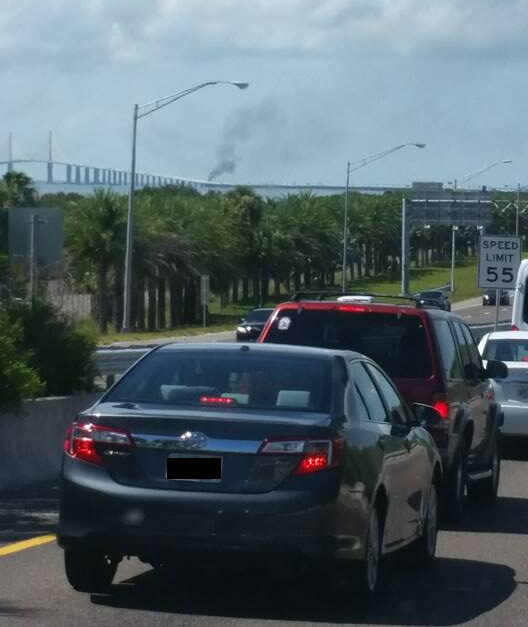 -----Skyway: Reports that the crash involved a Mack Truck full of dirt. Avoid northbound travel on bridge. Unknown time for clean up. 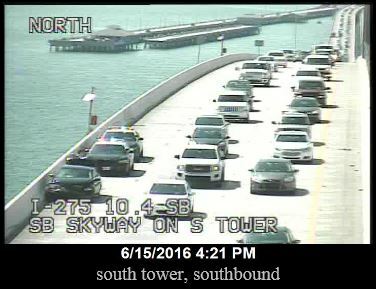 -----Skyway: Now reports of rollover crash in southbound lanes north of bridge. All traffic on the bridge closed in both directions. 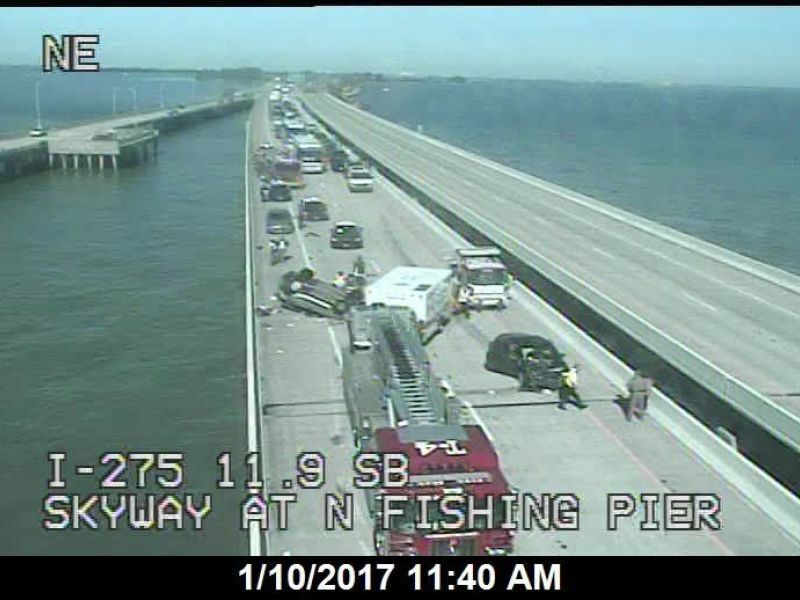 -----Skyway: Rescue crews so far reporting all occupants out of both rollover vehicles closing NB and SB lanes of the bridge. 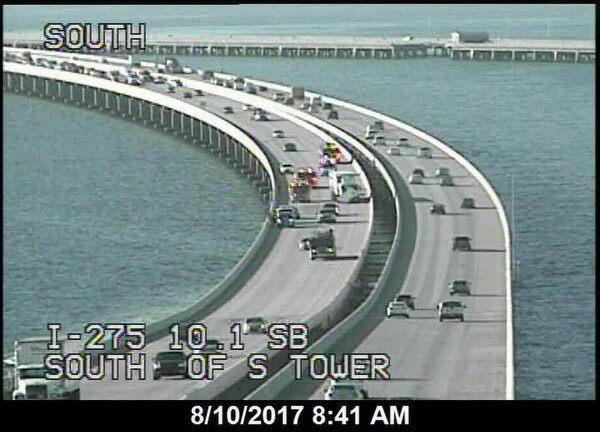 -----Update 11:48AM Skyway: FHP reports northbound all lanes are still blocked; southbound one inside lane/shoulder open at this time. 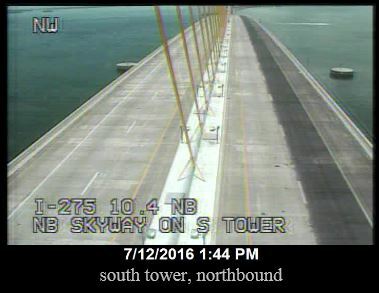 -----Update 1:20PM: Skyway: Southbound open. Northbound left and center lanes closed according to FHP. 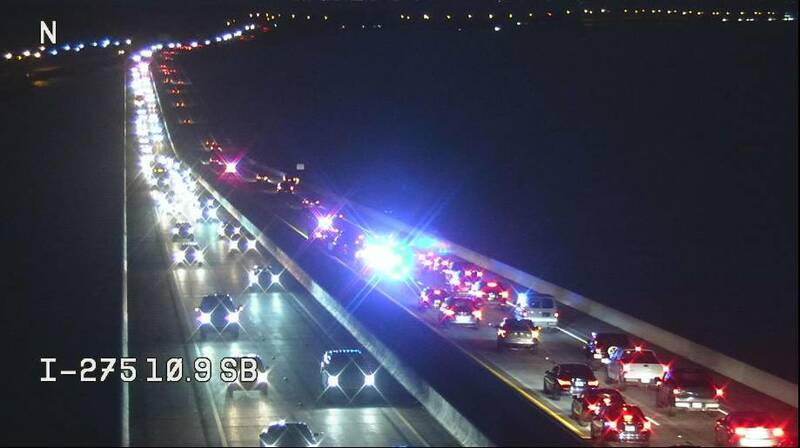 TIERRA VERDE (FOX 13) - The Florida Highway Patrol is investigating two separate crashes that blocked traffic on both the northbound and southbound lanes of the Skyway Bridge Tuesday morning. A Ford F150 had a flat tire and was parked on the outside shoulder. FHP says Rico drove into the emergency lane and hit the F150. The dump truck overturned and spilled a load of dirt on the bridge, causing the northbound lanes to be closed until 2:15 p.m.
Rico was ticketed for careless driving. He suffered minor injuries. The second happened 10 minutes after the first, in the southbound lanes of the Sykway at the 11 mile marker. FHP says Meredith J. Killingsworth of Palmetto, was driving a Honda Civic southbound on the bridge. She apparently didn’t notice traffic stopping ahead and she hit the back of a Honda CRV in front of her, pushing the CRV into the outside barrier wall before it overturned. Both scenes are now cleaned up, but motorists should expect lingering delays as the congestion clears out. 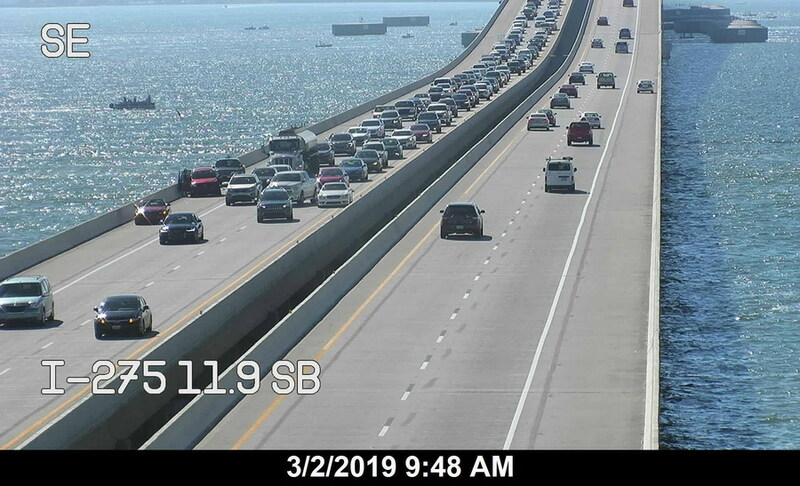 (WFLA) — Traffic was back to normal on the Sunshine Skyway Bridge Tuesday afternoon, after accidents on both sides of the bridge backed up traffic for many hours. A Florida Highway Patrol spokesperson said that both accidents happened near milepost 11 around 11:10 a.m. The northbound crash involved an overturned dump truck with a spilled load of dirt. That crash blocked traffic in the northbound lanes. A second crash involving two vehicles happened in the southbound lanes near milepost 11. The accident backed up traffic in the southbound lanes. The accident in the northbound lane happened when a car hit a dump truck that was pulled over in the emergency lane due to a flat tire. The southbound accident happened when a vehicle tried to switch lanes when the vehicle in front of it had stopped. Only minor injuries were reported in each case. The Skyway has re-opened in both directions. 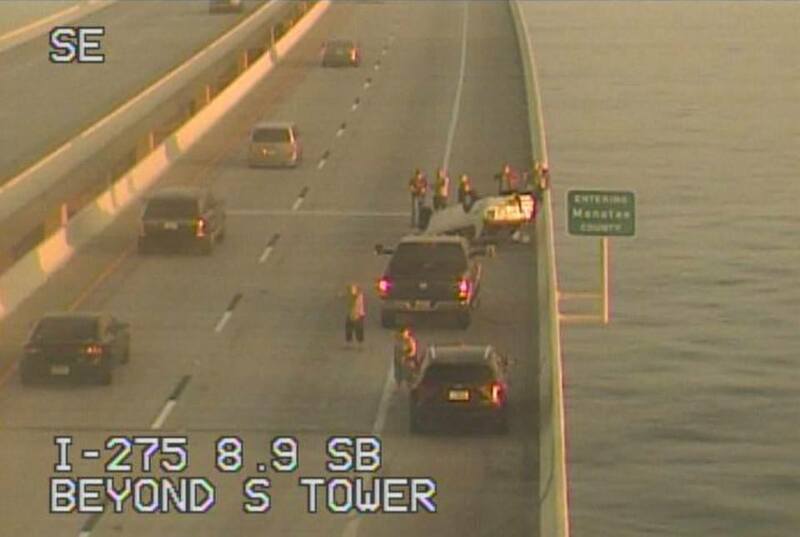 Original Story | Crews are working to clear an overturned dump truck on the Sunshine Skyway Bridge. The dump truck flipped in the northbound lanes and spilled a load of dirt. It is unknown if the driver was hurt. Crews are also working to clear an overturned SUV in the southbound lanes. 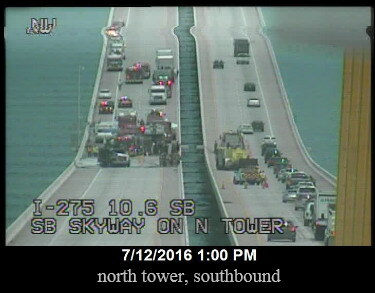 12.30.16, IONTBfb/iontb.com, Skyway Bridge: All southbound lanes closed due to fatality crash. Extrication ongoing to remove 2nd person now a trauma alert. 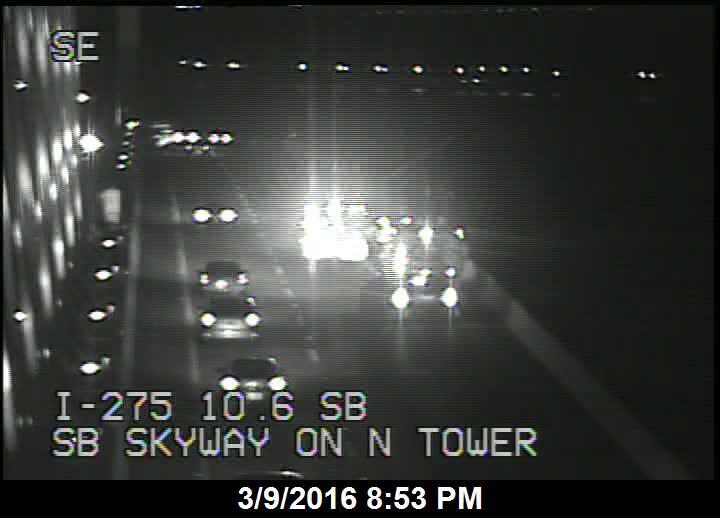 ----- Update 6:40AM Skyway: According to FHP, fatal crash claims 1 resulting from wrong-way driver. 2nd victim now listed in stable condition at hospital. All SB lanes remain closed. On December 30th at 3:43 AM, a 2005 Ford 4 door traveling northbound in the southbound lanes of the Skyway Bridge collided nearly head-on with a 2000 GMC pickup near the 8 milepost. The female driver of the Ford sustained fatal injuries and expired at the scene of the crash. The male driver of the pickup was transported to Blake Medical Center where he is now listed in stable condition. The southbound lanes of I-275 are closed at 54th Avenue South in Pinellas County. video: from the south toll booth, looking south. watch her car going north, the wrong way, in the southbound lane, on the far right. 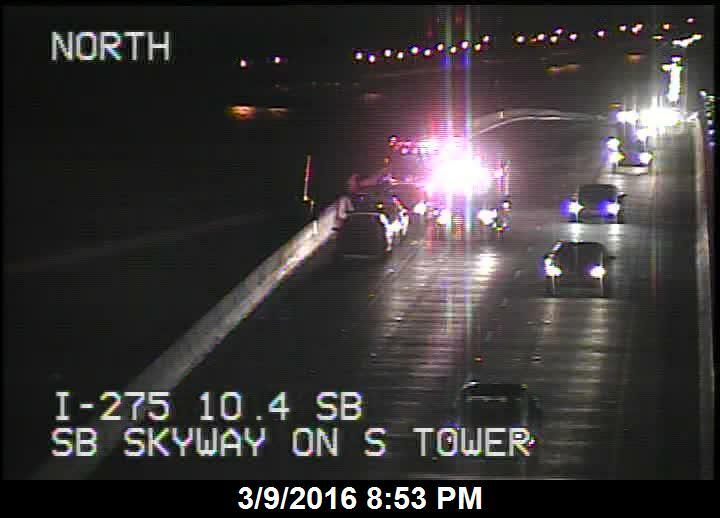 BRADENTON -- The southbound lanes of the Sunshine Skyway Bridge have been closed due to a fatal wrong-way crash. According to the Florida Highway Patrol, the crash happened just before 4 a.m. on the Manatee County side of the bridge. Troopers said a woman driving a 2005 Ford 4-door sedan collided nearly head on with a 2000 GMC pick-up truck. The male driver of the pick-up was transported to an area hospital in stable condition. Authorities have not said when the lanes would reopen. St. Petersburg police have southbound access to the skyway blocked at 54th Avenue South. 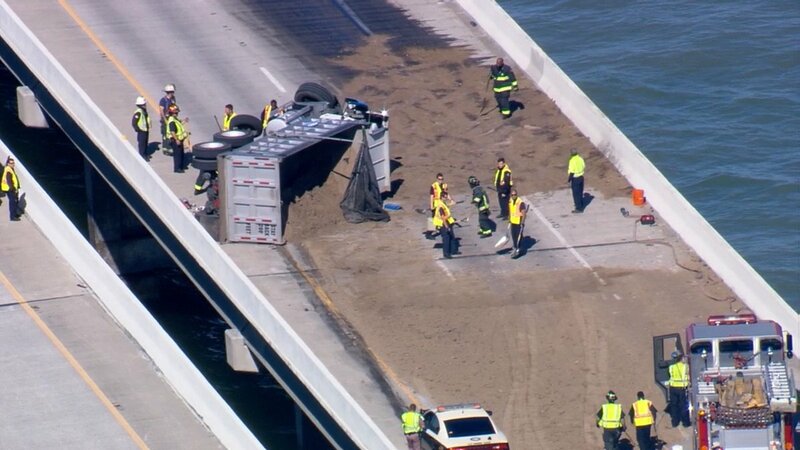 MANATEE COUNTY, FL (WFLA) – The Florida Highway Patrol has released the names of the drivers involved in a wrong-way crash on the Sunshine Skyway Bridge early Friday morning. 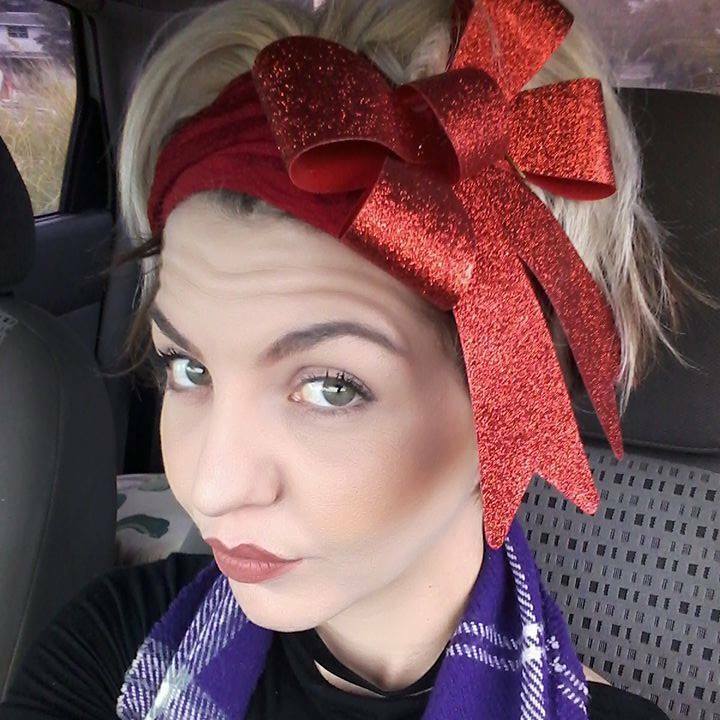 Troopers say Shontel Nicole Chase, 29, was driving a 4-door Ford northbound in the southbound lanes of the bridge around 3:45 a.m.
Investigators say Jon Allen Mitchell, 55, saw Chase heading in his direction and steered his GMC pick-up truck to the right. Troopers say Chase then steered her car to the left and collided head on with Mitchell’s truck. Chase died at the scene. Mitchell was taken to Blake Medical Center with critical injuries. 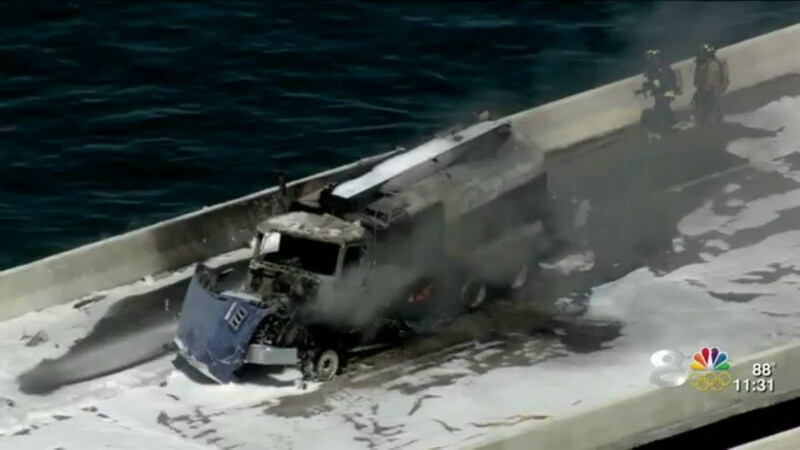 Joseph Finno driving on the Sunshine Skyway Bridge when it happened. “It was about a quarter to 4, I was heading southbound, noticed all of a sudden these headlights came up on me real quick. I was in the slow lane at the time, I was in the fast lane,” he said. “They were driving at a very high rate of speed. I tried to honk my horn, tried to do anything, but obviously they were going at a high rate of speed, but they weren’t really swerving or anything,” he said, recalling what happened. “I’m just glad the guy in the pickup truck wasn’t hurt, sorry the lady passed but glad the guy in the pickup wasn’t hurt too bad,” he added. Chase’s stepfather, Clay Lavoie of New Port Richey, calls it a tragic mistake and doubts his stepdaughter was drinking and that somehow, he says, she became disoriented. “I asked her and she finally came out and said she was dead,” he said remembering the call Friday morning he had with family after troopers delivered the devastating news. Chase’s family is now left to ask how. How could Chase be driving the wrong way on the Sunshine Skyway Bridge? “We just don’t understand what and how this happened,” Lavoie told News Channel 8. The video from toll plaza cameras on the south end of the bridge capture Chase heading north. Chase’s family apologizes but at the same time knows, an apology is not enough. “We know that this was not intentionally do at all, whatsoever,” Lavoie told News Channel 8. Chase does have a record and was charged with DUI back in 2010 but plead guilty to a lesser charge of reckless driving. Lavoie told News Channel 8 he doesn’t what his stepdaughter was doing in that area at the time of the morning. She had told him she would be planning a party with a friend that was supposed to happen Friday night. 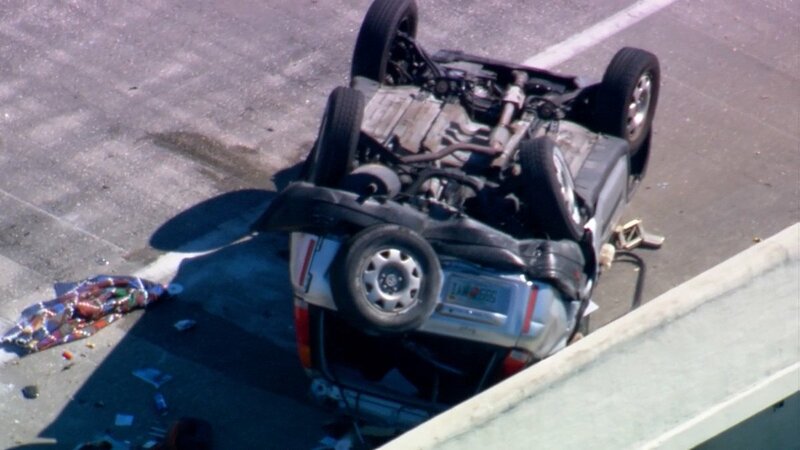 The 29-year-old woman who died early Friday morning in a wrong-way crash on the Sunshine Skyway Bridge that left another driver hospitalized could have been driving in the wrong direction for two to six miles before the collision, according to the Florida Highway Patrol. FHP Sgt. Steve Gaskins said video showed the wrong-way driver, Shontel Nicole Chase, heading north in the southbound lanes of Interstate 275 and going through the toll plaza on the Manatee County side of the bridge on her way to St. Petersburg. Chase's 2005 Ford Focus then hit a 2000 GMC pick-up truck nearly head-on around 3:40 a.m., the FHP said. The other driver, Jon Allen Mitchell, 55, tried to swerve right to avoid the oncoming vehicle, troopers said. Chase tried to steer left. Though both drivers tried to avoid hitting each other, their vehicles ended up colliding near the south fishing pier. Chase was pronounced dead at the scene. Mitchell, of Palmetto, was reported to be in critical condition at the Blake Medical Center in Bradenton. The driver's mother, Debra Chase, was inconsolable after she learned of her daughter's death. "Shonney is gone, Shonney is gone, Shonney is gone," the mother's fiance, Clay Lavoie, recalled her yelling when she shared the news with him on the phone. From outside their home on Friday, Lavoie described an upbeat future step-daughter who had found stability after financial troubles. "She had finally gotten on her own two feet," he said. "She had gone through some hard times in the past. She just got her car paid off." Chase worked as a hairstylist at Tim's Barber Shop in St. Petersburg. She went out with a co-worker Thursday night, Lavoie said, but her family didn't know why she was in Manatee County. As the sun rose on the crash scene Friday morning, Chase's white Ford was crumpled up against the bridge's wall. The collision sent both vehicles spinning. Lavoie thought she may have gotten mixed up when pulling out of a nearby rest stop and getting on the interstate. "It's confusing down there even during the day," he said. Chase had six driving infractions dating back to 2009, according to state records, including a DUI charge from January 2010. She completed DUI school and substance abuse program. Gaskins said investigators were still investigating the crash, piecing together how Chase spent her last hours. But it was too early to say whether alcohol was a factor in the crash. "Right now the corporals are going back to create a trip plan and recreate the 24 hour period leading up to the crash," he said. "Were you at work, sick, healthy, tired?" Chase grew up in New Port Richey and graduated from Gulf High School. She went on to study hair at the Paul Mitchell School in Tampa. She was close to her mother and doted on her Yorkshire Terrier, Wally. After just four months working there, Chase had already grown close with her coworkers. "We're a family here, we're not associates," said Melinda Schneider, the manager at Tim's Barber Shop. "We lost a family member today." Chase had planned to attend a birthday party Friday night, Lavoie said. Now, he and her mother were dreading having to clean out her apartment. Mitchell's family could not be reached for comment. Chase's family planned to take it day-by-day. "That's all we can do," Lavoie said. PALMETTO, FL -- The family of a Palmetto man is counting their blessings one day after wrong way driver hit him head on, on the Sunshine Skyway bridge, Friday. Jon Allen Mitchell's family says he faces a long recovery. He was driving in a white truck southbound when troopers say the driver of another car was going the wrong way Friday Morning. The other driver, Shontel Nicole Chase, 29, died in the crash. “How and why? To see a wrong way driver on the skyway bridge, that was the part we couldn’t put two and two together on how that person would get on the other side,” said his brother, Mitch. 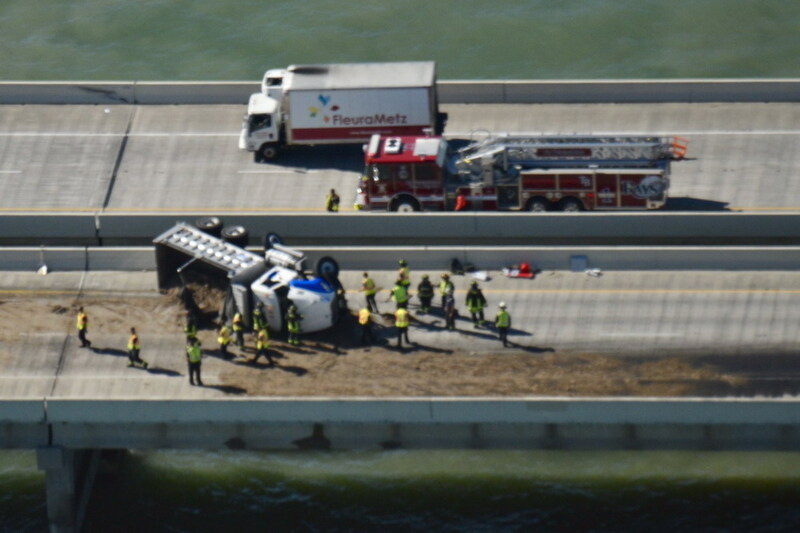 The crash shut down all southbound lanes of the Sunshine Skyway for more than four hours, causing drivers headed to Manatee County to be redirected through Interstate 75. According to the crash report, Chase was not wearing her seatbelt at the time of the crash. It is unknown whether drinking was a factor in the crash, but the FHP report says there was a strong odor of alcohol in her car. An autopsy report is pending. Mitch says the family is not harboring any hard feelings towards her. He further says his brother saw the car coming, but at some point he the headlights of the car cut off and it was tough to avoid it. The day began like any other for 58 year old Jon Mitchell who resides in Palmetto, Florida. Throughout the day he operated a tree service business and at night worked as a disc jockey. During the early morning hours of Friday, December 30, 2016 that his life was changed forever. He was driving his 2000 GMC Sierra pickup truck home from work after being a DJ for an event. At about 3:40 a.m. Mitchell was traveling southbound over the Skyway Bridge and was struck by an impaired wrong-way driver who was traveling northbound in the southbound lanes of the roadway. He swerved to the right trying his best to avoid the crash but the driver of the oncoming vehicle steered to the left, leading to a head on collision. Mitchell was transported to Blake Medical Center with critical injuries as a result of the crash that closed the interstate for almost 5 hours. IONTB was able to contact Jon Mitchell and his fiancée, Debra, to get an exclusive update on his status. Jon spent over 2 months in the hospital including almost 2 ½ weeks in intensive care undergoing 12 surgeries. Soon after the crash, surgeons needed to perform a below the knee amputation also losing full use of his left arm and hand. These injuries made it impossible for him to continue working the jobs that helped pay his bills. He cannot even begin to fathom the extensive quantity of medical bills that have been received. He states that many have been paid by Florida Medicaid but they will not pay for his rehabilitation. Meetings with a couple lawyers have not been productive but yet he continues to take it day by day with the support of Debra. Debra and Jon have been together for over 7 years but Debra stated, “this year has been extremely difficult.” This difficulty was compounded by his 56th birthday and Valentine’s Day occurring while he was in the hospital with Debra trying to support him every step of the way. She also recalls spending Easter Day with him in the rehab center. 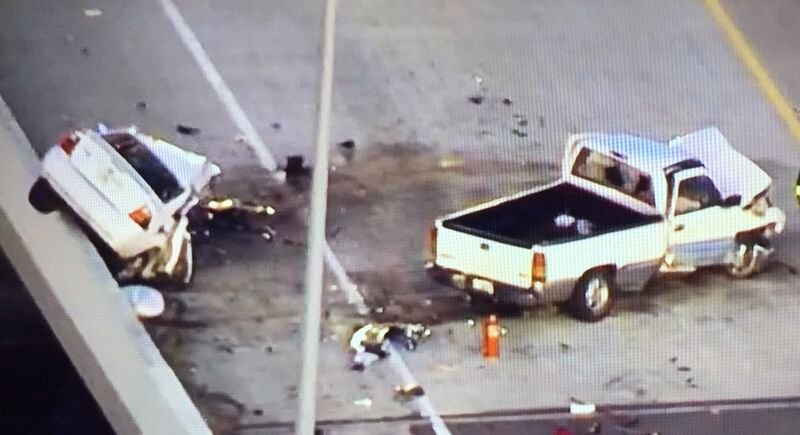 The wrong-way driver was identified as 29 year-old Shontel Chase of New Port Richey, Florida. Chase died at the scene of the crash which left her severely damaged 2005 Ford Focus partially resting on the bridge retaining wall. According to FHP, she was also not wearing her seat belt as she traveled northbound in the southbound lanes of the Sunshine Skyway Bridge. IONTB has obtained the report from the District Twelve Medical Examiner’s Office in Sarasota, Florida. The report documents that Chase’s Blood Alcohol Concentration (BAC) was .186. In Florida, the presumption of impairment applies when the BAC is over .08. The drug screen also showed the presence of cannabinoids, the main chemical compound found in marijuana. Previously, Chase was charged with a DUI in Hillsborough County in January 2010. She plead guilty to a lesser charge of reckless driving and was placed on probation which included a community service requirement. Debra was never told that Chase was impaired by alcohol and states they never had any contact with Chase’s family. “No apology, no nothing,” said Debra, referring to Chase’s family members. It was only a few days ago that Jon fell and broke his hip above the same area where his lower leg was amputated. He stated that his surgery to place a rod into his leg is scheduled early next week. In the meantime, Debra stands by his side helping to support him physically, financially and emotionally while Jon tries to cope with this tragic and preventable incident. 12.19.16: car fire on the bridge. 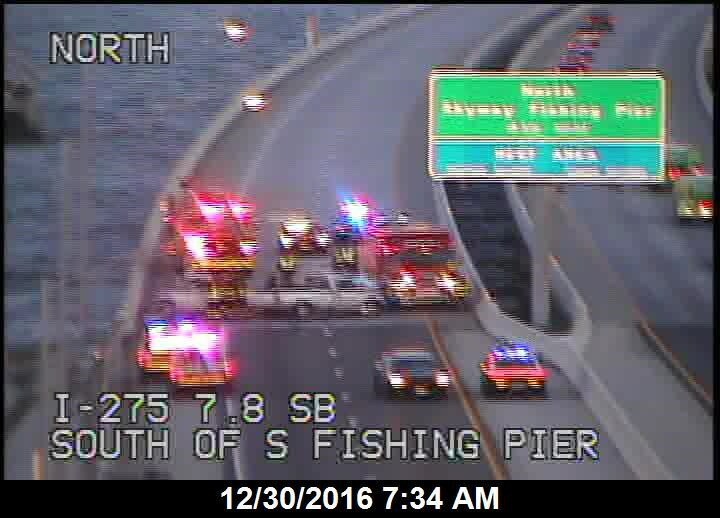 12.19.16, bradenton.com, Both lanes of southbound Skyway Bridge reopened after car fire. 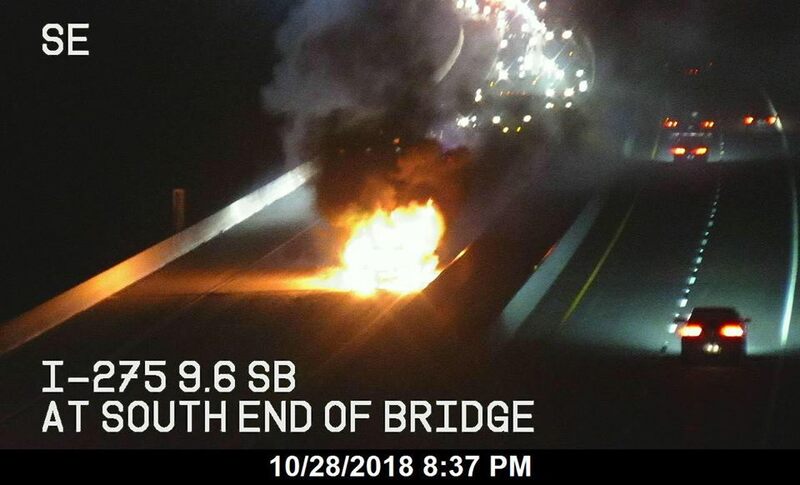 Pinellas - Both southbound lanes of the Sunshine Skyway bridge have reopened after they were blocked after a car fire, according to the Florida Highway Patrol. The fire was reported just before 11 a.m. Monday near the southbound exit to the bridge, according to Pinellas County Safety and Emergency Services. 12.03.16, Kim E., facebook, Drove over bridge 11am today 12/3 Southbound. Saw several emergency response vehicles (lights on) and 2 FHP officers looking over the side with binoculars. Right next to the red phone at the very top. I pray that it wasn't a jumper. ST. PETERSBURG — Florida Highway Patrol troopers Saturday found the body of a woman who jumped from the Sunshine Skyway bridge earlier in the week. 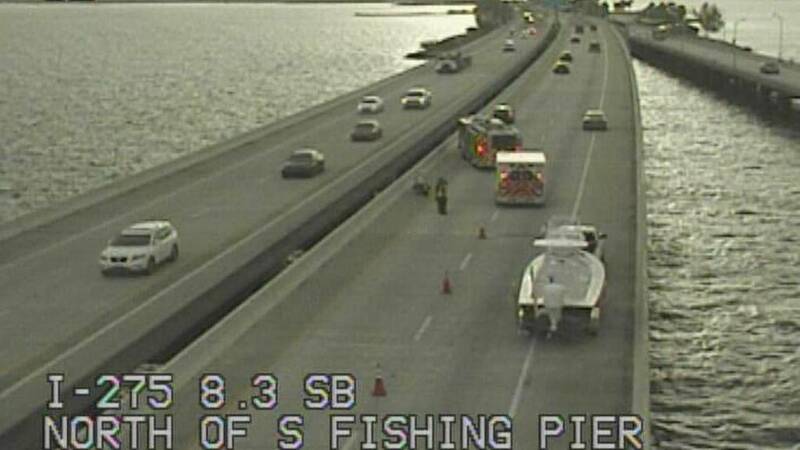 Authorities originally went to the scene after a caller falsely reported a car going off the bridge into the bay, FHP spokesman Sgt. Steve Gaskins said. In the process of trying to find the car, which they later learned did not go into the bay, troopers recovered a body from the rocks below the bridge. "We believe it is a female who jumped from the bridge earlier this week," Gaskins said. St. Petersburg — A body has been found under the Sunshine Skyway Bridge, according to the Florida Highway Patrol. Authorities were originally called Saturday after a vehicle reportedly went off the bridge into the bay. While officials were searching for the car, they found a female body located along the rocks, according to FHP. No car was found in the bay. 10.27.16: car fire on the bridge. 10.27.16, IONTBfb/iontb.com, Crews cleaning up after putting out vehicle fire in southbound lanes on the Skyway. 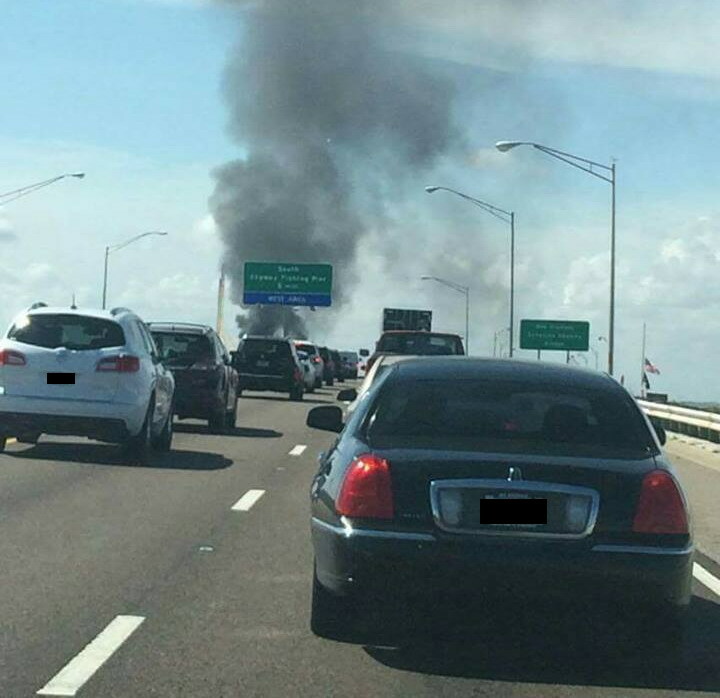 10.27.16, bradenton.com, Pinellas - A vehicle was reported on fire on Interstate 275 south on the Sunshine Skyway Bridge , according to the Florida Highway Patrol. Troopers were dispatched to the scene at 2:14 p.m. Thursday. Troopers said smoke is in the area and encouraged motorists to be cautious. All lanes are currently blocked, according to a tweet from the Florida Department of Transportation. 07.28.16: car fire on the bridge. 07.28.16, IONTBfb/iontb.com, Skyway: Northbound lanes closed due to this car fire. Avoid the area. later: All lanes reopened as of 5PM. later: 59 year-old James Preston of Palmetto was traveling in the inside northbound lane of the Sunshine Skyway Bridge approaching MM14. The right rear tire malfunctioned and Preston lost control of the Chrysler Pacifica departing the travel lane and collided with the outside barrier wall. Following the crash, the vehicle then became engulfed in fire. St. Petersburg Fire Rescue responded and extinguished the fire. 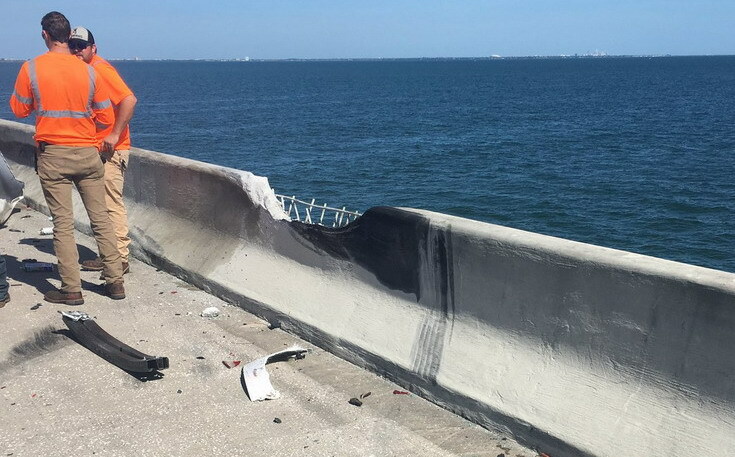 PINELLAS COUNTY, Fla. (WFLA) – The northbound lanes on the Sunshine Skyway Bridge reopened Thursday afternoon after a fiery crash. Northbound lanes were closed for about an hour. According to officials, the tire on a driver’s 2010 Chevy Pacific minivan blew out, forcing the driver to lose control and crash into barrier wall. The driver, James Preston, 59, was able to escape from the vehicle before it burst into flames. Preston managed to walk away uninjured in the crash. 07.12.16, IONTBfb/iontb.com, Skyway: All lanes of the bridge being closed due to tanker fire full of 4 thousand gallons of diesel fuel. Driver with minor injuries. 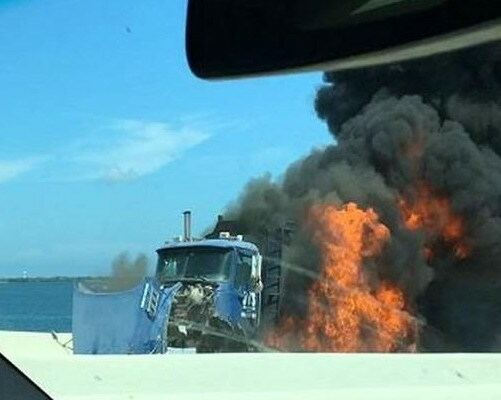 07.12.16, wfla.com, Southbound lanes of Sunshine Skyway Bridge closed due to tanker fire. 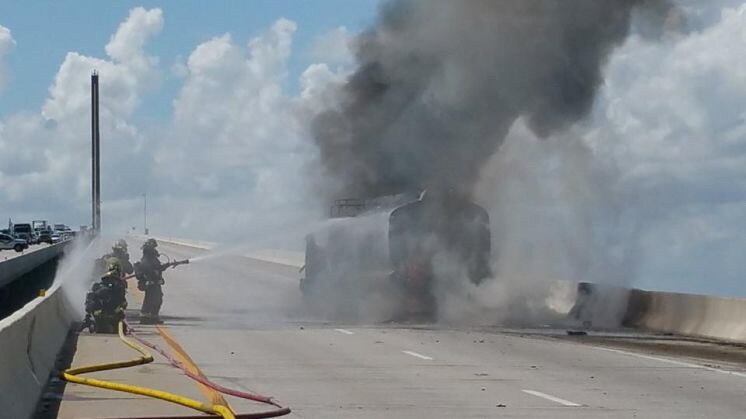 07.12.16, bradenton.com, Sunshine Skyway bridge closed because of tanker fire. 07.12.16, tampabay.com, Crews examining stability of Sunshine Skyway Bridge after tanker truck fire. 06.15.16: crash at the top. 03.09.16: crash near the top. 03.09.16, Chris N., What's going on here?